The students of Bayero University in Kano state North West Nigeria have taken to the street in protest of the on-going ASUU strike, as the students have asked the federal government to give ASUU what it has demanded within a week. Though, the students were restricted to the university gate in a peaceful protest staged in support of the ASUU, they say they will not stop, neither will they retreat nor surrender until the federal government honours its agreement with ASUU which will eventually take them back to classes. President of the Student Union Government in Bayero University Kano, Comrade Muhammed Sani says they have waited for so long and students’ academic calendar has been affected by the strike action, but worst of all government’s refusal in granting ASUU’s request. The Vice-Chairman of ASUU BUK chapter, Abdulsalam Khalil says there is no going back until the demands of the Union are fully implemented. In the meantime, the students have given the Federal Government up to one week to meet the demand of ASUU, the failure of which they say will resort to a nationwide students protest. 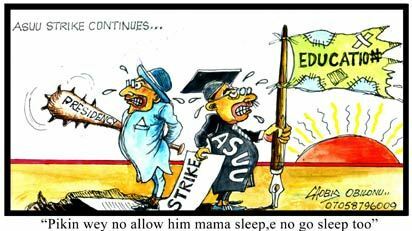 It will be recalled that lecturers, under the aegis of ASUU, had on June 30 embarked on what it had described as comprehensive, total and indefinite strike in public universities across the country, running into its 98th day today (i.e 26th September, 2013). The President, Academic Staff Union of Universities (ASUU), Dr Nasir Fagge, said on Tuesday that the current strike by lecturers of public universities in the country was a sacrifice for better things to come. He said unless the deficits in the education sector, especially the university system, were addressed once and for all, there would be no development. The lecturers are asking for the implementation of some aspects of an agreement they jointly entered into with the Federal government in 2009. He said that the industrial action was a sacrifice needed to salvage the entire economy of the country and it is regrettable that the strike is protracted, but the decision of ASUU to remain adamant until its demands are fully met is non-negotiable though uncomfortable and worrisome.